This article is about the mission in Splatoon. For the mission by the same name in Splatoon 2, see Octoling Assault (Octo Canyon). 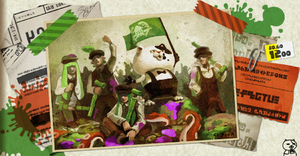 Octoling Assault is the fourteenth mission available in single player Octo Valley. It takes place in a modified version of the multiplayer stage, Blackbelly Skatepark. Mission 14 is located on the 2nd level of the tower in Area 2. When on the 2nd level, find platforms resembling a staircase, then the grate path will take Agent 3 to Mission 14. You leave the start area and Cap'n Cuttlefish sees some Octolings. The Octoling comes and tries to attack. These can easily be killed by seeker bombs. From the start to the second checkpoint there is a line of Power Eggs. Ink the ramp and climb up it to reach the second checkpoint. On the ledge of the central tower, there is a box that contains an Octoling. Now there is a line of power eggs up the ramp to the top of the central tower. In the orange box on the top of the tower there is a suit of armour. There is also another Octoling on the ground.In another ledge in the wall there are some power eggs. Drop down the side of the tower and climb the ramp to the third checkpoint. After you pass that, on the ramp to the left, there is a Canned Special, which contains a Inkzooka. 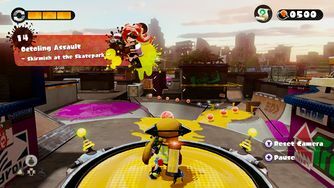 There are Octolings shooting at you, whilst trying to do this. On the grates to the right there is a box which contains some power eggs. There is also a line of power eggs running to the next part. On one of the smaller ramps, there is a box which contains a suit of armour. There is also an Octoling trying to splat you when you approach. There is a path of power eggs to the Gusher. However, before you activate the gusher, you need to go on the path to the right, and at the end is a box, which contains the stage's Sunken Scroll. Then run back, activate the gusher, and burst the Zapfish out of it's shield. Location: At the far North of the map, along the wall in the Northeastern corner. Go through the level as you normally would. One you have reached the gusher leading up to the Zapfish, turn around to face the South, toward your original spawn. Go along the elevated path to the left until you reach the small crate containing the scroll. The Italian name for this stage contains a pun on imboscata (ambush) and skate.